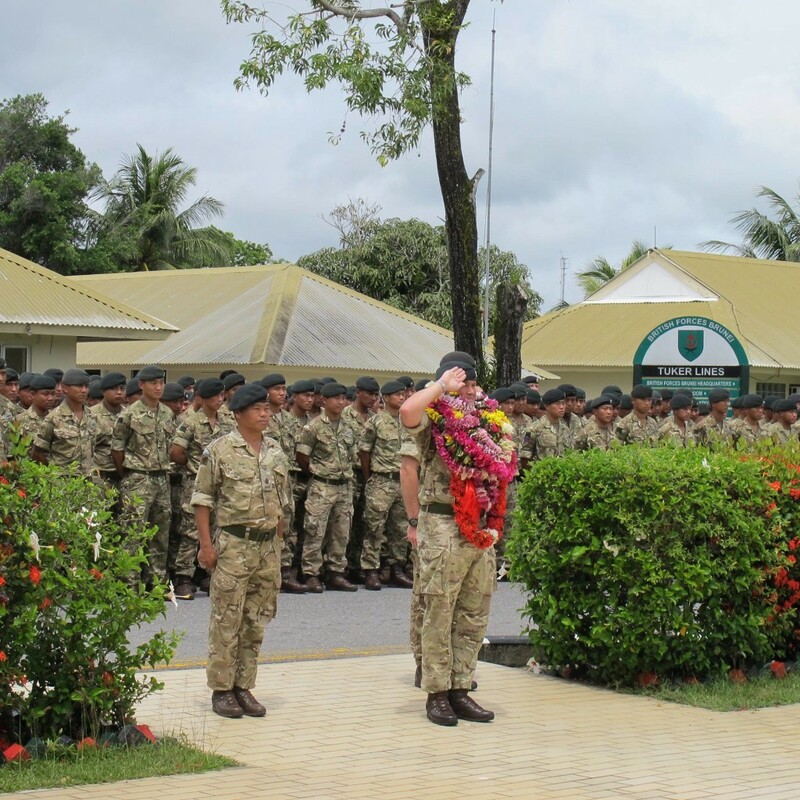 1st Battalion The Royal Gurkha Rifles (1 RGR) bid farewell to their Commanding Officer (and Commander British Forces Brunei) of two years, Lieutenant Colonel Jody Davies MBE, on 22 July 2016. The farewell was held in Tuker lines Seria and was a celebration of his successful tenure attended by members of the Regiment and the Garrison. 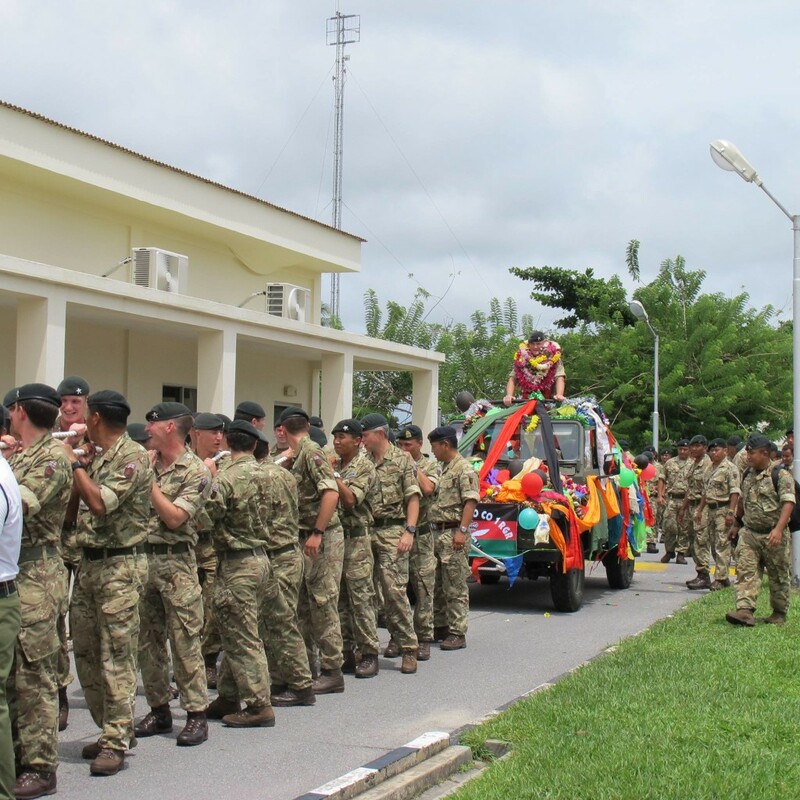 The main part of the parade was the Brigade tradition of hand-towing the Commanding Officer (CO) to the Guardroom for him to perform a final ceremonial inspection of an Honour Guard. Early on the morning of the 22nd July, Colonel Davies presided over his last parade as Commander British Forces Brunei. 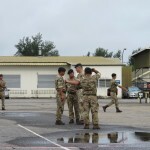 Promotions from Rfn to LCpl and LCpl to Cpl from across the Garrison were awarded and there were also awards given for the Long Service and Good Conduct Medal. 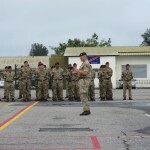 The Battalion’s Skill At Arms and Golf competitors were thanked for their outstanding performance and contribution to the Regiment. 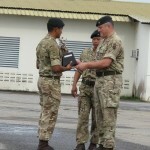 The parade was also an occasion to mark exceptional performances by awarding Commander’s Coins to certain individuals. 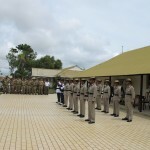 This included a large number of Civil Servants and Locally Employed Civilians as well as soldiers. 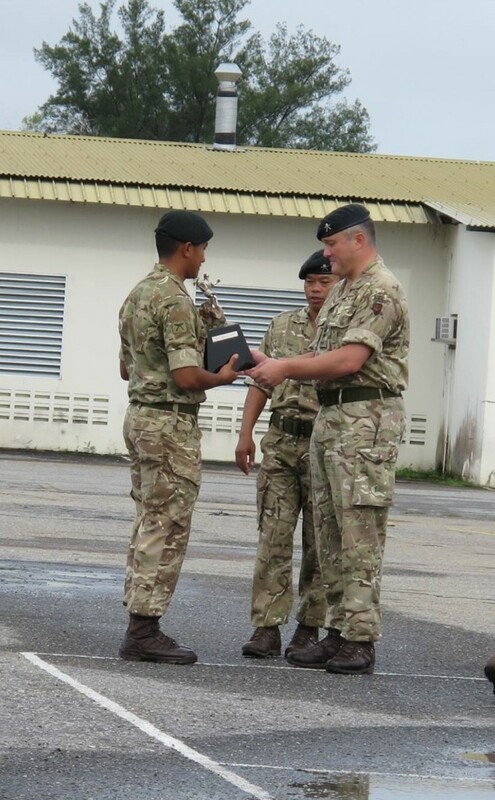 The Parish Trophy was awarded to Rfn Sajendra Gurung who was deemed the best Rfn in the Battalion and he has now been promoted to Corporal. 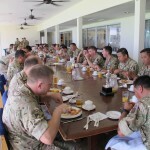 Following the parade, the CO had a ‘hunters-breakfast’ at the Garrison Officer’s Mess accompanied by all of the British and Gurkha Officers from across the Garrison. 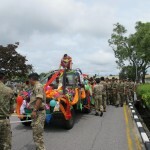 Escorted by Gurkha Major 1 RGR, Maj Chandra Pun, he was then driven to the Temple where he paid his respects and offered a prayer for the Battalion – a well-known and important part of our Gurkha tradition. 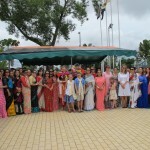 On completion of the Puja from Punditji and a blessing from the Padre, the CO left the Temple and was greeted by all of the Officers, WOs and SNCOs. 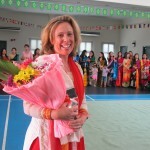 He shared a quick word with each of them and was, in turn, presented with a mala or khata. 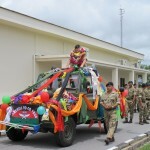 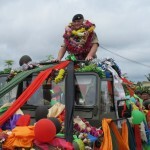 The CO then mounted an open-topped Land Rover, which was decorated in brightly coloured garlands and was towed to the Guardroom by the Officers of the Battalion. 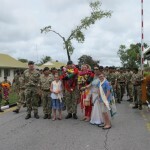 The Pipes and Drums led the way, and the route was lined by JNCOs and Rfn, who cheered him and presented more flowers and khatas. 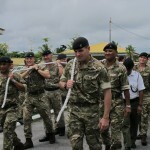 Once the procession reached the Guardroom he was presented with a Guard of Honour. 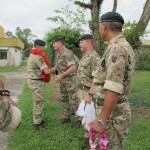 The CO inspected the Guard and the Pipe Major returned his pipe banner which he subsequently presented to the Officer’s Mess. 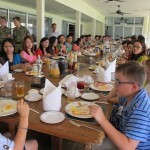 The CO then addressed the Battalion and assembled families for the last time and reminded us of all the significant achievements which had been completed over the last two years in Brunei. 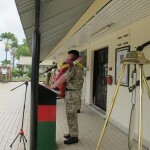 He made a special mention of the Defence Engagement which the Garrison had completed with other nations and advised us as to how and why we should maintain the good name of 1 RGR. 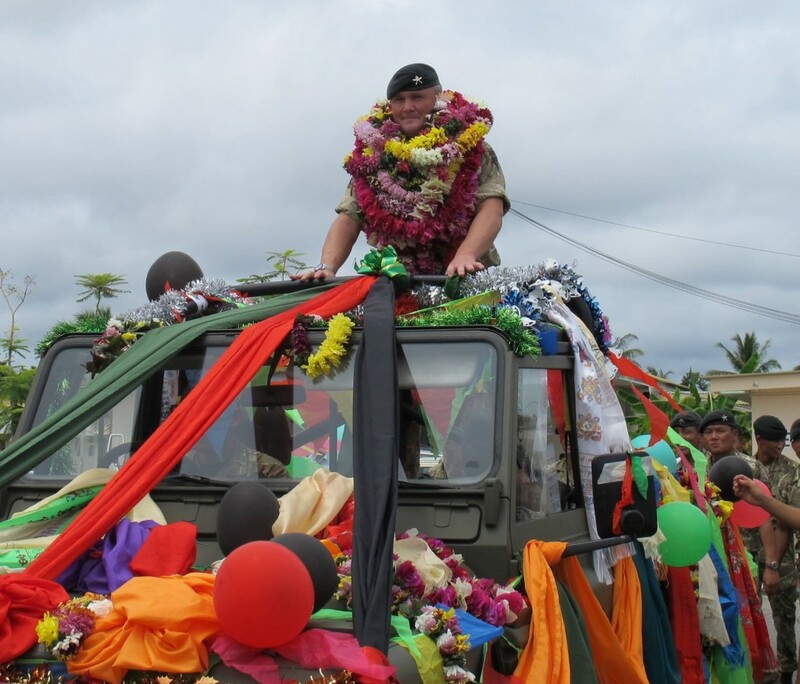 At the end of the speech he thanked everyone including the families for their support and said good-bye to everybody for the last time. 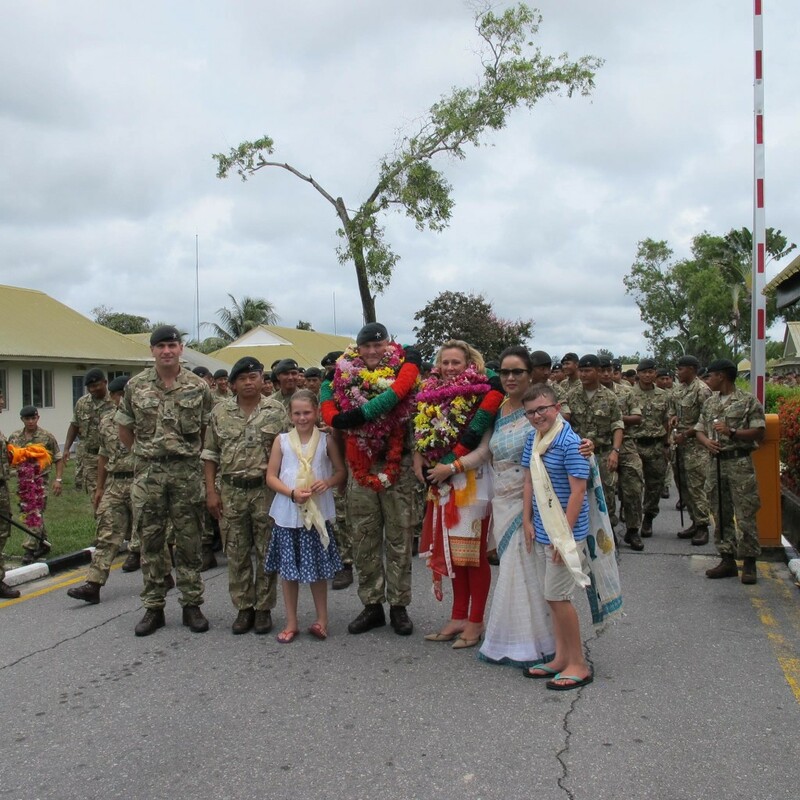 British Forces Brunei and all their families would like to sincerely thank CO Saheb and Mem saheb for their support to 1 RGR and the wider Garrison, and to take this opportunity to wish all CO Saheb’s family the very best for the future. 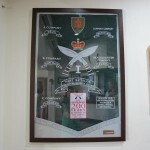 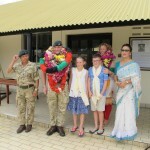 JAI Lt Colonel Jody Davies Saheb and Family.